The faithful guitar, whether it is an electric or an acoustic, the guitar makes an appearance on almost every song ever recorded. Even for electronic productions, many of the melodies, hooks and riffs will be fleshed out first on the guitar then transferred over. Along with the developments in recording equipment, recording guitar has become as easy as turning on a light switch. All you need is a guitar, an audio interface and a computer. The easiest way to get a simple guitar part recorded would be to go straight from the guitar into the interface, which then goes to the computer and there you have it. Now as many bedroom producers (myself included) can achieve decent guitar sounds from this method, we are going to be looking at some of the other methods there are to get that desired guitar sound. When recording guitar there are a number of different factors to take into account, things such as type of sound, what sound are you going for? Is it a punk song that needs to be fast punchy and brash or is it a number number that needs to be round and full? This leads us to our first point, the settings of the amp and guitar. Depending what amp you’re using you will be met with a certain amount of tonal, dynamic and amplitude controls, as well as the usual EQ settings. Some amps may have built in reverb, chorus or delay, and most come with distortion or gain as standard. Now this can take some time to decided on but once you’re happy with the settings and sound you are getting from the amp then it’s time to move on. 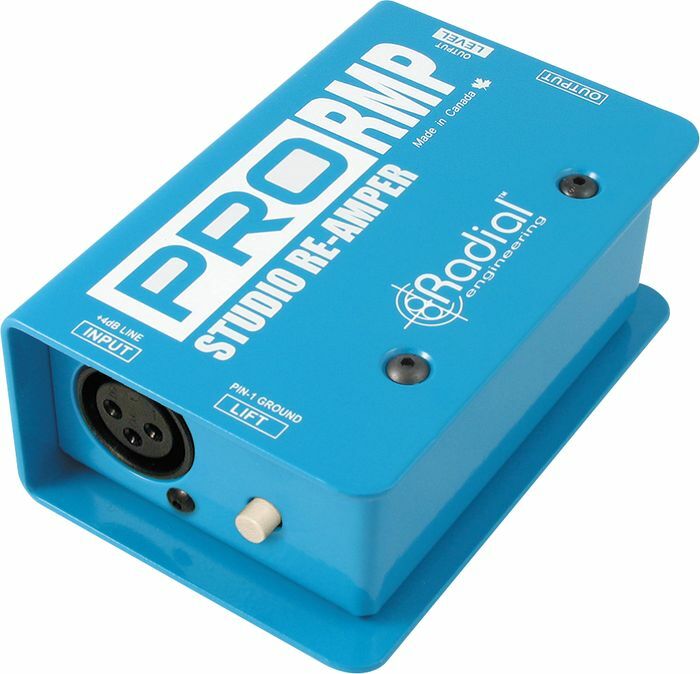 Make sure that you are happy with the sound you have from the guitar, the amp and the pedals if you’re using them because the issue can arise where once the guitar is recorded there is no going back**, that’s the sound you’re stuck with, unless you want to fork more money out for another day tracking guitars. Below is a list of the three main types of microphones we have for recording and some of the most popular brands, following on from this we will dig a little bit deeper to understand the inner workings of each type below. Dynamic microphones are mostly used for live sound, because of the way they are built they can handle higher SPL then their counterparts. The work on an electromagnetic principal, they feature a thick diaphragm that is wrapped in a coil of wire and the magnetic structure causes the coil to vibrate by the changes in SPL. Condenser microphones can be used on loud sound sources as well as quieter elements such as vocals, acoustic guitar or a ukulele because of their warm, round sound. 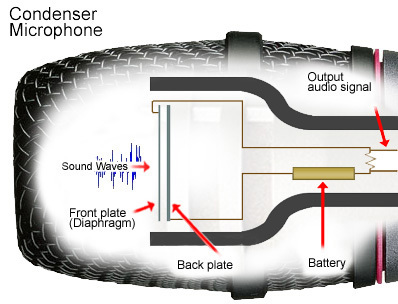 Inside a condenser mic there are two plates when sound comes into those plates, one of them stays stationary and the other reacts to the changes in SPL. Finally we have ribbon mics. These are the most sensitive of all the microphones, they are very fragile and are built with a very thin aluminium diaphragm that is placed between two magnets which causes the fragility. 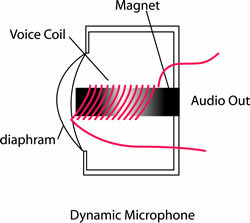 Condenser microphones use 48v phantom power to work, but very careful when using ribbon mics because if you have been using a condenser and activated 48v phantom power and you connect a ribbon mic to it, it will blow the ribbon microphone, because they are built so fragile and delicate sending 48 volts will destroy ribbon within it. So beware! They sound fantastic though and are used on strings, guitar amps and drum room mics. 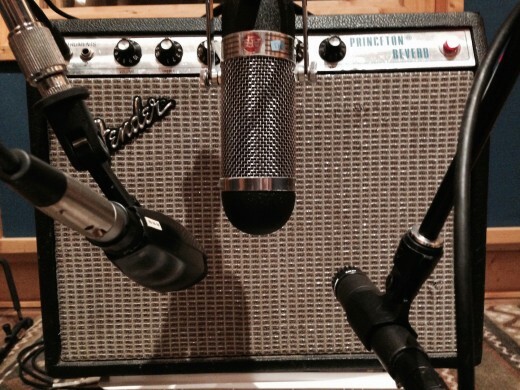 As for recording guitar amps, all three of these types of microphones can be used and a combination of them could result in some excellent sounding recording. Many producers will use one of these or a combination of these. As is well known around the music industry that the bog-standard microphone for recording guitar amps is the Shure SM57. When recording an amp you have a certain area you can cover, the speaker cone that is located behind the grill is what you’re aiming for. Positioning the microphone in different places around the speaker cone changes the sound that the mic is picking up, this is where multi-miking can come in useful. Many engineers will tell you that a 57 stuck right in the middle of the cone will get you a good rock sound but always experiment! I like to have my 57 pointing at the centre of the cone but at a slight axis and usually only a few centimetres away from the grill. This should result in a good level and sound getting recorded into your DAW. 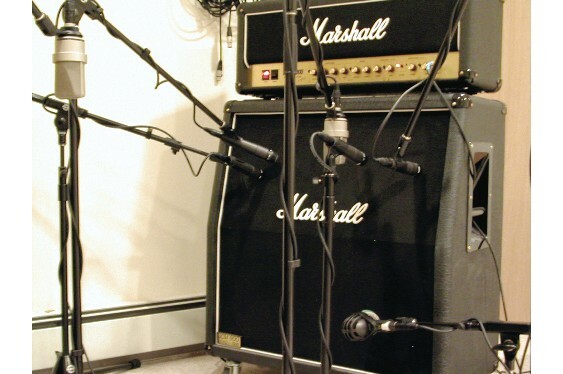 Another popular method of recording guitar amps and cabinets is to have a close-mic such as a 57 or AKG 414, then have another mic – usually a condenser a few feet away. This might seem strange to the novice recording engineer but this second mic will pick up more of the room ambience and when mixed with the close mic can provide some natural reverb and add space and depth to the overall recording, you can then blend these two as you please. As mentioned before usually amps and cabs will be multi-mic’ed to the bands or engineers preference, so when you start off it’s always best to experiment and find out what works the best for the sound you are trying to create. **Sound Training Tip : Always, always, ALWAYS take a D.I recording of any of the guitar tracking you do, as well as the recorded one. This can be very beneficial to both the band and engineer. If the band change their mind, or there is a snag that you happened to miss during the recording process, if you have a D.I copy of the take then you can always either use software emulation or re-amping to get the sound you were looking for in the first place! We will cover advanced techniques and re-amping in a up-and-coming post! Keep your eyes peeled!